The first AP Poll of the 2018 season is out, and defending national champion Alabama tops the rankings. The Crimson Tide are No. 1, but they only edged No. 2 Clemson by 29 points. That’s reasonable. Alabama is fresh off a national title and is absolutely loaded on both sides of the ball. 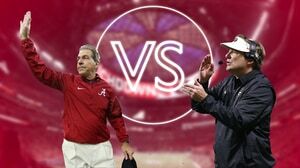 Its biggest question: quarterback, where Nick Saban is choosing between a guy who’s brought Alabama to two straight title games (Jalen Hurts) and another who came off the bench to win a ring in the second half against Georgia (Tua Tagovailoa). Hurts is steady, but lacks star potential. Tagovailoa looks like he could be spectacular, but we haven’t seen enough of him to really know. Most college football programs would love for this to be their most pressing issue. Alabama’s defense and running game should be as dominant as ever, so it’s going to be another big year in Tuscaloosa. Clemson is right behind Alabama, and there’s an argument to be made that the Tigers’ defense will be the best in the country. They bring back their entire front seven from last year, which was already a standout group. Several key players could have bolted for the NFL but chose to stay in school. The Tigers are going to terrorize opposing backfields. Most teams don’t have a defensive player as good as Clelin Ferrell, Austin Bryant, Dexter Lawrence or Christian Wilkins. Clemson will use all of them at the same time; double team one, and there are a handful of others who can dominate one-on-one matchups. Clemson’s offense was good enough to run through the ACC last season, but it faltered against Alabama in the biggest game of the season. Kelly Bryant has some Hurts to his game, and the Tigers welcome heralded freshman quarterback Trevor Lawrence. In order for Clemson to overtake Alabama, one of two things needs to happen: either Bryant becomes more than a game manager, or Lawrence is as good as advertised right away. Both are conceivable. 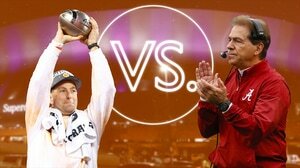 Alabama and Clemson could face one another for the fourth College Football Playoff in a row. There’s a fairly big gap between No. 2 Clemson and No. 3 Georgia in voters’ minds, but the Bulldogs are still national title contenders. Nick Chubb and Sony Michel are gone, which stings. Roquan Smith’s departure hurts the defense. But D'Andre Swift is a darkhorse Heisman candidate and Kirby Smart has built up outstanding depth in Athens. Smart doesn’t have as reliable of a track record as Saban or Dabo Swinney, so it’s fair to slot Georgia behind those two considering the losses. But the Bulldogs are supremely talented; they just need a few first-year starters to pop. Some other teams stand out in the first rankings of the year. Oklahoma, which lost Baker Mayfield, checks in at No. 7. Voters clearly have faith in Lincoln Riley, and the Sooners don’t have a ton of competition in the Big 12. Kyler Murray, a top-10 pick in the MLB Draft, is perhaps the most interesting player in the country coming into the year. He was inconsistent during his brief stint at Texas A&M, but combining his dual-threat ability with Riley’s scheme is tantalizing. But Mayfield was so good. He carried the Sooners last season. 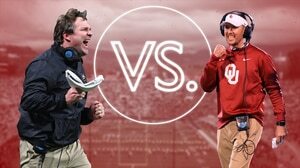 It’s fair to be bullish on Oklahoma, but expectations are certainly lofty the year after they lost a Heisman-winning quarterback. Another ranking that sticks out is No. 14 Michigan. The Wolverines struggled in Jim Harbaugh’s third season, finishing the year unranked and extremely injured at quarterback. Michigan welcomes Ole Miss transfer Shea Patterson, who threw for 2,259 yards and 17 touchdowns in the SEC last year. If he’s as good or better at Michigan than he was at Ole Miss, this ranking will be justified. The defense should be elite, led by stud defensive tackle Rashan Gary. Michigan was young on defense in 2017 and brings back a ton. Get replacement-level play out of the quarterback spot, and this team should win nine games. Get something more, and you have a sneaky College Football Playoff contender. The Big Ten has five teams in the top 14. Michigan has stiff competition in the East, but if Patterson balls out, the Wolverines have the juice to compete with the best in the conference. A few other notables: No. 19 Florida State, No. 23 Texas and No. 24 Oregon are three prestigious programs looking to bounce back in 2018. Voters seem confident they will. Florida State and Oregon have new coaches. Willie Taggart bolted from the Ducks to the Seminoles in the offseason and seems to have reenergized the fan base. Florida State is coming off its worst season in a long time, but it was very young and very injured. Watch out for running back Cam Akers, who should top 1,000 yards with ease. This feels like a big year for Texas, which has a nice opportunity to finish in the upper half of the Big 12. Malik Jefferson will be missed, but there’s talent in Austin, as usual. And when Justin Herbert is healthy, Oregon is good. He’s healthy going into the year and is surrounded with plenty of offensive weapons. The college football season is rapidly approaching. It can’t come soon enough.